K-pop boy band SHINee’s main vocalist Jonghyun wants to try “sinigang,” a popular Filipino dish, while EXO-K’s Baekhyun wants to go to Baguio with other members of the group. 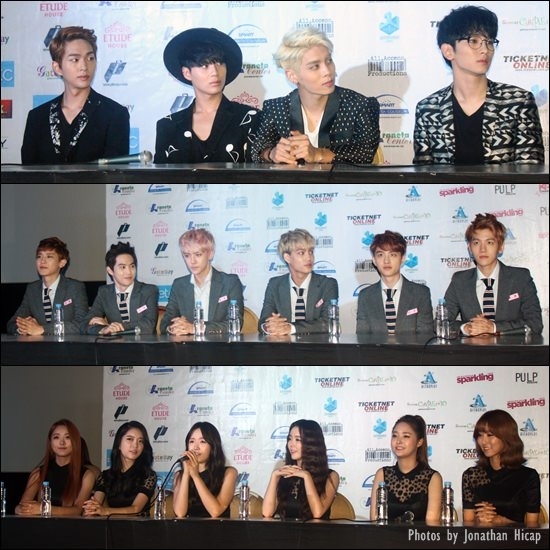 These are but some of the things that SHINee and EXO-K revealed at the press conference for K-pop Republic concert which was also organized by All Access Productions and JU Entertainment and held Sept. 7 at the Araneta Coliseum. The concert also starred Dal Shabet. It was the second visit of the K-pop groups to the Philippines and they spoke about the places they want to visit in the country, their careers and fans, and the concert. SHINee said they’re very happy to meet Filipino fans for the second time. “(It’s) because you guys have been waiting for so long and waited for us patiently,” he explained. Jonghyun also said he wrote the lyrics for songs in SHINee’s third album released this year. “I have written two songs in the album. One is about one-sided love and the next one is missing someone. I wrote both songs while looking at the moon,” he said. Onew is currently starring in the Korean sitcom “Royal Villa” and said he’s trying to perform at par with other cast members. “It’s my first time to try acting so I try hard to be on the same level as the other actors,” he said. Key is also popular because of his unique fashion style which, he said, is an extension of his identity. Like SHINee, this was also EXO-K’s second performance in the Philippines. Composed of Suho, Chanyeol, D.O., Baekhyun, Kai and Sehun, EXO-K said the Philippines has become more attractive since the last time they were here. “It has become more beautiful. We felt very welcomed at the airport because there were so many fans excited to see us,” said Sehun. EXO rose to become one of the most popular K-pop groups today. Chanyeol said they don’t have yet an official name for their fan club. “We believe the fan club name should be named from our fans. We’re hoping to get more fan club names suggested by them,” he said. 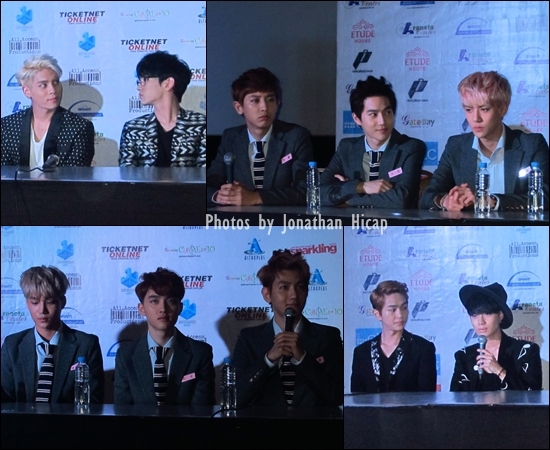 If they can stay longer in the country, EXO-K said they would like to visit Baguio. “We heard that it has fresh air and good environment. We would like to go there with our members and relax and think about our holiday,” said Baekhyun. Dal Shabet members are also impressed by the Philippines. The group had a pictorial in Cebu in 2011. “All of our members were so inspired because Philippines was so wonderful–nice weather, kind people and delicious food,” said Jiyul. She said her Filipino friends recommended for her to visit Farmers’ Market in Cubao. “I have two Filipino friends (and) they said (that) if you go to Farmers’ Market, you can feel the Philippines. Is that right?” she said. Asked if there were artists that they idolized, Subin said she likes Beyonce while Jiyul picked Spice Girls. Serri said she loves Britney Spears while Woohee chose Rihanna. Ah Young and Ga Eun picked Dal Shabet as their idol. Jiyul thanked their fans and asked them to keep in touch. “Thank you for inviting us, and thank you for loving us, Dal Shabet. I love the Philippines…” she said.